Other details:My father-in-law was killed by the Japanese Army in 1943, and people in the village can provide witness testimony. I strongly demand Japan to give compensation. 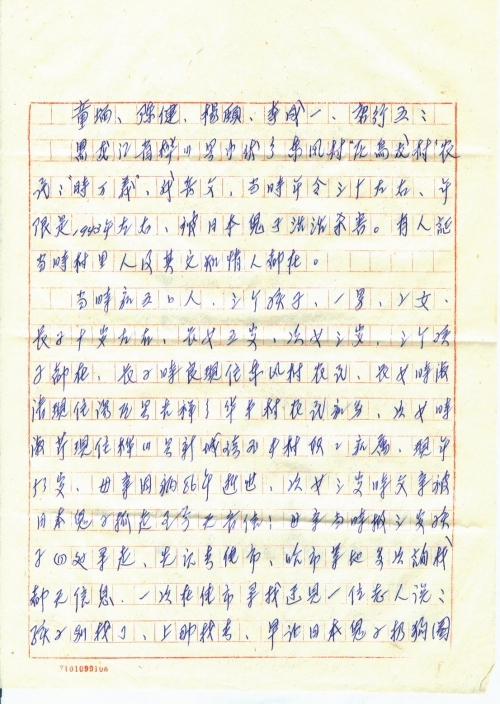 In about 1943, my father-in-law Shi Wanyi, then about 30, a farmer of Dongfeng Village (former Wulong Village), Zhongfu Town, Huachuan County, Heilongjiang Province was killed by Japanese soldiers. Witnesses include other villagers and some people who know about this. Back then, my father-in-law’s family had 5 members, including 3 children, 1 son and 2 daughters. The oldest son was about 10, the first daughter was 5 and the second daughter 3. The 3 children are all alive. The oldest son Shi Liang is a farmer in Dongfeng Village, the first daughter Shi Shuqing is a farmer in Huafeng Village, Jixiang Town, Tangyuan County and the second daughter Shi Shuqin, now 53, is the wife of an employee in Yufeng Village, Xincheng Town, Huachuan County. My mother-in-law died of illness in 1986. My father-in-law was captured by Japanese soldiers when his second daughter was only 3 and his whereabouts were unknown so far. My mother-in-law, carrying the 3-year-old daughter, went to Jiamusi, Harbin, etc. for many times to look for him, but in vain. There was one time in Jiamusi when she met an old man, who told her, “Kid, stop looking for him. He must be thrown into a dog cage by the Japanese.” Thus, my mother-in-law gave up and stopped seeking for him. My mother-in-law struggled to live with 3 children and later was forced to marry Wu Guangshan as she couldn’t raise them up on her own. By memory and calculation, my father-in-law was captured in 1943. During 1931 and 1945 when Japan invaded China, there were some Japanese soldiers living nearby Fuxing Village, Zhongfu Town. It is a solid fact that the invading Japanese army bullied and killed innocent people in China, which is well known by Chinese people. As a Chinese, I will never forget the blood debt! I strongly demand the Japanese government to compensate for our life and property losses. We shall thoroughly reveal the terrible crimes committed by the Japanese army in China. We’d like to participate in the signature campaign. 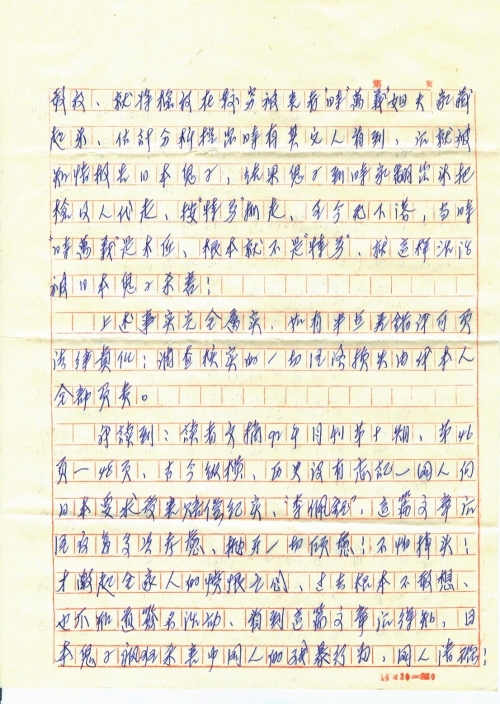 Written by the victim Shi Wanyi’s son-in-law Zhang Junyou on behalf of the victim. It happened like this. 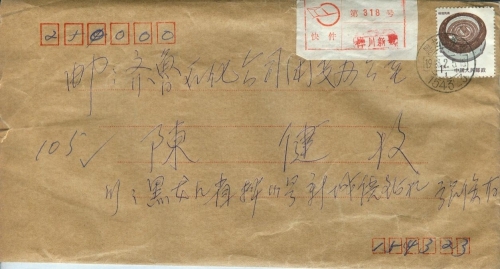 In about 1943, the victim Shi Wanyi’s younger brother-in-law Hou Xiangwen dug out a pistol from somewhere. At that time, they were a large family with many brothers. His younger brother-in-law had no place to put the pistol in his own house, so he hid it in the poor victim Shi Wanyi’s house. We guess when his younger brother-in-law dug out the pistol, he must be seen by someone who told the Japanese soldiers. So the Japanese soldiers rummaged through the house, found the pistol and took Shi Wanyi away by treating him as a spy. His whereabouts are unknown so far. Back then, Shi Wanyi was a carpenter. He was never a spy. But he was killed by the Japanese soldiers. The above facts are true. I will take legal responsibility for any error. All expenses of the investigation and verification are borne by me. 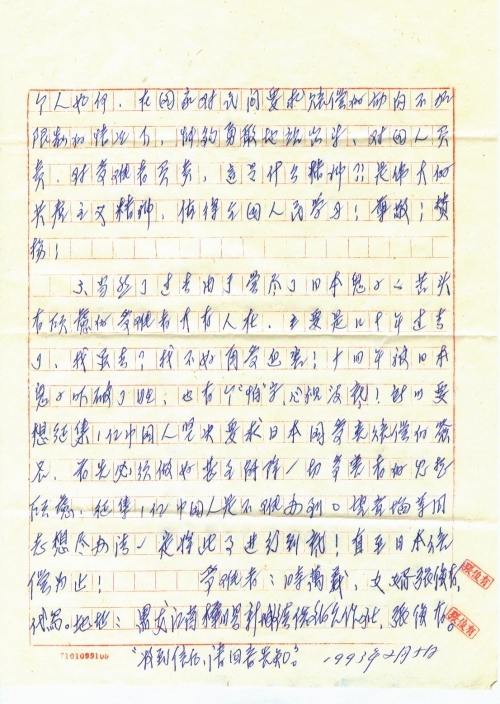 After reading the article “History Is Not Forgotten: Records of the Chinese People Demanding Damage Compensation from Japan” by Li Peiyu on page 46-48, Issue 10 of the monthly magazine Reader’s Digest of 1992, my whole family became quite indignant. We learned about the signature campaign and the fact that not only the Chinese people but people around the world know well about the atrocities of the Japanese army. 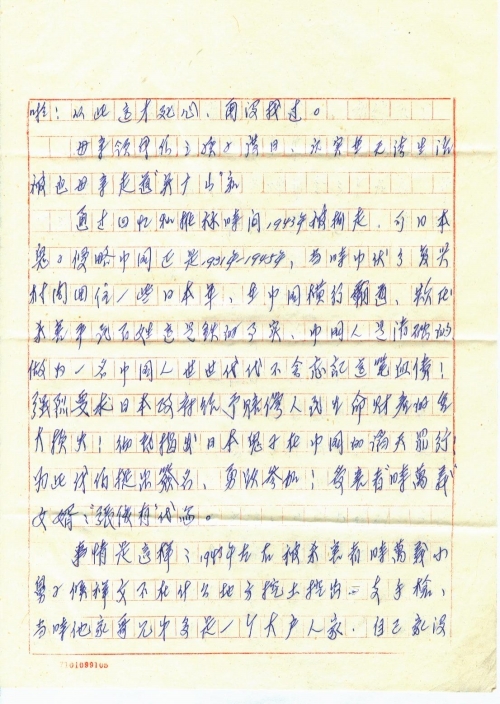 Victims like us must bravely speak out their suffering and demand justice and compensation from the Japanese army who brutally killed the innocent Chinese people. 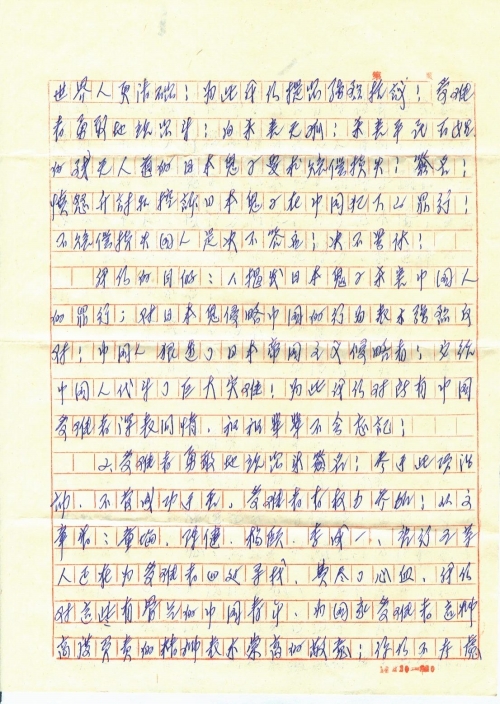 We’d like to join the signature campaign and indignantly charge the Japanese army with crimes they committed in China. The Japanese government must compensate the Chinese people. We won’t take no for an answer. Our goal: 1. We shall reveal the Japanese army’s crime of killing Chinese people. We express strong opposition to the Japanese army’s invasion of China. The Chinese people hate Japanese imperialist invaders to the core because they brought a great disaster to us. We feel sorry for all Chinese victims and we and our future generations, will never forget their suffering! 2. We want to participate in the signature campaign. No matter it will succeed or not, victims have the right to participate in it. According to the article, five Chinese young people including Tong Zeng, Chen Jian, Yang Yi, Li Chengyi and Tang Xingwu are working hard to seek victims. We’d like to express our highest respect to you for your bravery and strong sense of responsibility. Regardless of personal interests, you speak out for victims when our country does not restrict civil claim for compensation and take the responsibility of our people and victims. Your great spirit of communism is worth learning, respect and praise from all Chinese people. 3. Many victims who have suffered a lot from the atrocities of the Japanese army are still haunted by fear. So, to gather the signatures of 100 million Chinese people demanding damage compensation from Japan, we must, above all, remove the fear of all victims. Then, it is not hard to fulfill the task. Tong Zeng, etc., please use all means to carry through the matter to the end until Japan compensates us!